I haven’t had much time for new posts recently, so here’s a quick look at some “3D-style” mapping. As you can see, it was a bit of a bargain – I always think you don’t need to spend much to get something interesting, as long as you have fun looking. 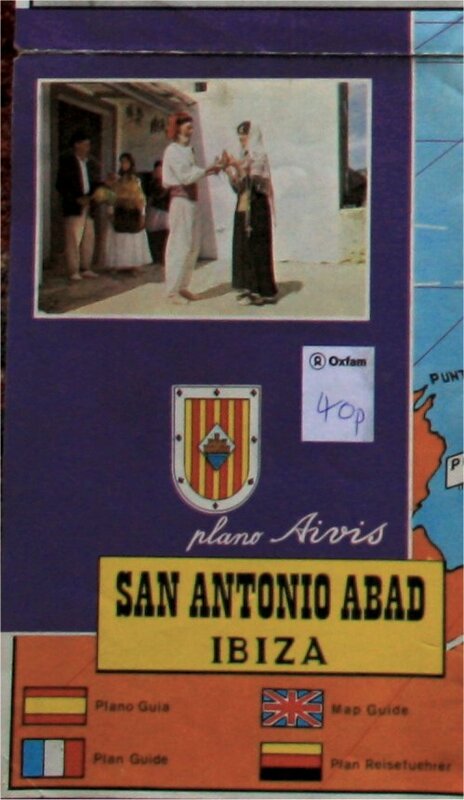 Anyway, this is a 1973 tourist map of Ibiza, notable for the 45° viewing angle, giving an perspective view of the landscape. 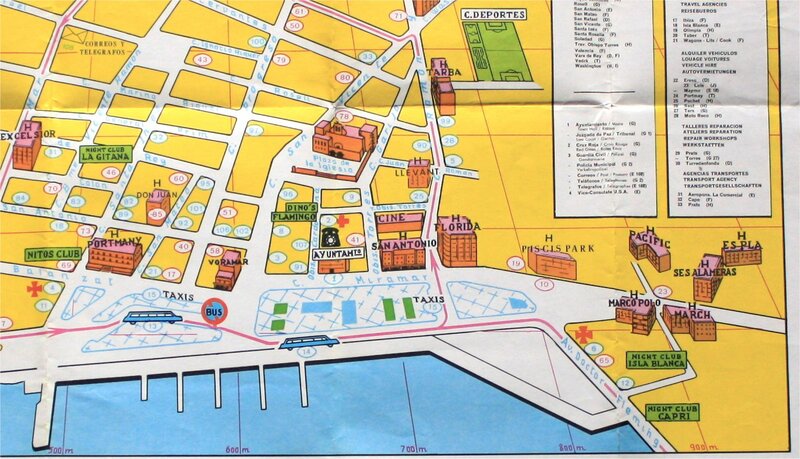 A number of buildings – mostly hotels, along with a cinema, petrol station, town hall, bullring, etc. – are drawn over the street network in a 3D style. I’ve mentioned before how I love a handmade style, and this map is especially ropey. The hotel labels are all at a slightly different angle, and the fonts are a bit all over the place too. I’m not sure what’s going on with the Hotel Hawaii – perhaps it’s the cartographer’s favourite hangout. The location billboards are all at odd angles too, and at first I thought there was a shadow behind the Carretera a Santa Ines sign, but it must be an arrow pointing behind the hills, like the signs for Carretera a Ibiza and Carretera a San Jose. The stacked label justification and alignment varies a lot too, and some of the labels in the bay are completely different: Bahia de San Antonio has a stepped baseline, with all the characters staying upright, and Ferry Boats is curved. Both of these labels are in a different font, much more uniform, as if printed on the map some time later. The majority of the sheet is taken up with the inset map shown here. I love the limousine taxis, or are they buses? They’re certainly long enough. There’s more free rein given to fonts and label styles – maybe this map was actually put together by a number of different people. Interestingly, the street labels all seem to be arranged so there is no text over the junctions. For example, C. San Vicente, just behind Plaza de la Inglesia, is broken in mid-word, even though there are no other obstructions there. Towards the top of the sheet, you can see how the grid lines converge towards the vanishing point, though the vertical lines seem to stop converging once you get past column A. There is not much detail up here – even the street casings are broken away from the junctions, as if these sections are not to scale or incomplete in some way. 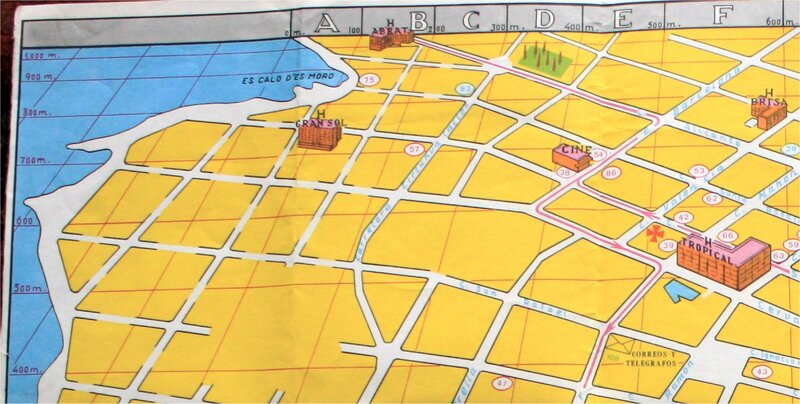 A map like this, while not of very high quality, still demonstrates how cartography is as much an art as a science. There are many decisions to be made – like which points of interest to include, what colour scheme and scale to use, how long to make your taxi symbols, etc. – that most people would be unaware of. As long as they can find their way to Dino’s Flamingo though, everyone’s happy.